Unlike local, state and federal law enforcement agencies, the media, the military, and those in the reality-based community who openly laugh at our fear of the brown invader, I've never doubted your reporting on the Los Zetas ranch takeovers. I know it hasn't been easy for you to defend your story. No one likes to be called deluded, insane, or a liar, but you've handled it well--with only a minimal amount of screeching and no cutting that I'm aware of. All that's over now, because we finally have evidence. Compare these aerial photos of the Virginal White Woman Ranch taken on March 2 and August 11. As you can see, a Taco Bell was built on the property sometime after March 2. That's the best evidence yet that Los Zetas has taken the property. Invading Mexican drug cartel soldiers aren't worth a damn until they've had a bowl of their homeland's staple, Taco Bell's Cheesy Fiesta Potatoes, with their morning coffee. But, unfortunately, it's even worse than anyone could have imagined. Los Zetas isn't an ordinary Mexican drug cartel--it's a Mexican Muslim drug cartel. The proof is in the photo. They've built a mosque. No doubt a nursery for terror babies is next. 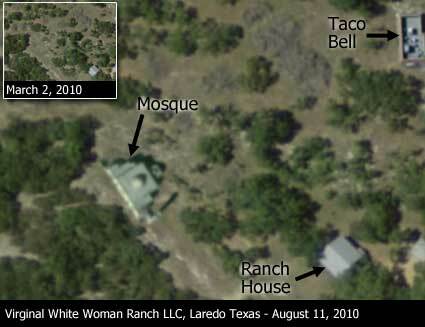 The existence of an Al Zetas mosque at Virginal White Women's Ranch also provides a critical piece of evidence we need to prove the Grand Tea Party Unification Theory. You've probably seen the reports that a Tea Party Archeology Team unearthed the Clenis (see figure c) during a birth certificate dig in Siaya, Kenya a few months ago. What you don't know is that a gang of "brown foreign-talking dudes" stole it from them last week. That sounds like Los Zetas to me. If it was Los Zetas, I think we've finally tied Obama, Islam, Kenya, Gays, Mexicans, the Antichrist and the Clenis together. Take a look at the figures below, and you'll see what I mean. In Figure A, I drew lines connecting Laredo, Siaya, and Mecca. Now take a look at Figure B and notice how those lines become a biometric identifier when overlaid on Obama's face. Laredo marks the outer edge of Obama's ear. The distance between Laredo and Siaya proportionately matches the distance between the edge of his ear and the top of his upper lip, and, again proportionally, the distance between his lip and his left nostril matches that between Siaya and Mecca. In Figure C, I rotated the lines clockwise by 66.6 degrees (the number of the beast) and found they matched the length and diameter of the Clenis. Again, It's all right there in the biometrics. I also found that experimenting on a photo of the Clenis aroused me in a way that caused me to question my commitment to the heterosexual lifestyle. That's the kind of power it holds. It's the kind of power the radical mullahs of Los Zetas craved and now possess. It's like the Arc of the Covenant, but instead of melting Nazi faces, it makes you want to listen to show tunes. Thank you, General. I've seen the Clenis before--it pops up just about everywhere and when you least expect it. This post has me convinced, and when I figure out what it is I am convinced about, well, there you go! After looking at that Clenis (but not for too long -- it's not hetero to stare) I can see why people referred to Slick Willy as "the first black president." Except if it was unearthed by an archeological team, maybe it was a prehistoriclenis. The explanation which I prefer is that the blacklenis was found by diggers in the spot where it landed after Hillary Bobbitized it off. OK. You finally talked me into registering. This one's too good to ignore.